Jm Mr Evan, under jockey Jesse Levario, qualifying to the Rainbow Juvenile Invitational at Ruidoso Downs. RUIDOSO DOWNS�JULY 8, 2015�Off his impressive trial win in Saturday's (July 4) Rainbow Futurity trials, Jm Mr Evan is a preferred invite for the $50,000 Rainbow Juvenile Invitational to contested on July 19 at Ruidoso Downs. The second five fastest qualifiers from each day of the 32 Rainbow trials are preferred invites to the 400 yard race for two-year-olds. Perfect with a 2-for-2 record, Jm Mr Evan races for owner J and M Racing and Farm and trainer Albert Franco. 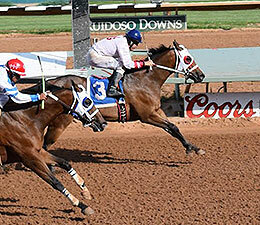 He also won his trial for the $850,000 Ruidoso Futurity(G1) in his career start last May. The bay colt ended with the 19th fastest time from the 297 head that competed over two days for the $1 million dollar Grade 1 Rainbow Futurity final. Fas Prize Doll was also a Rainbow trial winner. Bred by Joyce and Tory McClennen from the Tour de Kas mare Lawanda Fay, Jm Mr Evan sold under the name of Ducks Dynasty in last summer's Ruidoso Select Yearling Sale. Corner K Quarter Horses, LLC was the consignor. J & M Racing and Farm purchased the bay for $18,000 then changed his name to Jm Mr Evan. He has earned $4,800. Another Ivory James 2-year-old, Fas Prize Doll won the 14th Rainbow Futurity trial on the second day of racing. James Gonzales, II trains the Oklahoma-bred filly for owner Teddy Joe Cobb. The bay miss is from the Mr Jess Perry mare Fast Prize Doll. She has won two of three starts and earned nearly $14,000 this season. Weetona Stanley is the breeder.